We are excited to offer video running analysis at Body In Motion! By using slow motion video software, we can evaluate your running form frame by frame to identify dysfunctions. We will also perform a thorough physical analysis of muscle strength and length that may be affecting your running form. After your initial video analysis you will be provided with a home exercise program designed to address any limitations found, tips on how to improve your form and video clips from your running analysis. 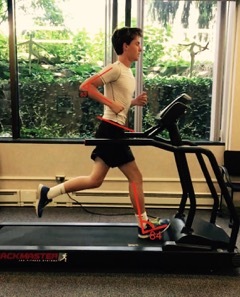 Our goal is to prevent overuse injuries and correct your running mechanics for optimal performance. Emily Tomlinson, PT, DPT, OCS, is leading the running program at Body In Motion. Emily is a Board Certified Orthopedic Clinical Specialist, demonstrating her expertise in diagnosing and treating orthopedic conditions. She has a great interest in bio-mechanics and has completed extensive continuing education in the area of running analysis. Emily is also an adjunct instructor in the Doctor of Physical Therapy program at Rockhurst University, where she teaches in her field of expertise.